psst: Buckle up for a long-winding intro. With the web’s expanse being so vast, searching the web is something we do everyday. Searching with Google or your favorite search engine can only get you so far. You’d have to trust Google to bring up the actually useful search results to the top to answer your questions every time. With so many people bent at gaming these very search engine results, pigs might fly before that happens. We have overcome this problem by bookmarking the sites we find useful. We may even use an online bookmarking service like delicious.com (yes, they dropped the dots this week!) to store our favorite sites. Then you could use delicious.com search to find your bookmarked favorites by keyword or tags. I find this an immensely useful strategy and you could see my bookmarks at http://delicious.com/KIntheHouse. I use this often when Google doesn’t seem to bring up the sites/pages I need. I have these sites in my Google Reader and read up on recent posts. Searching with Google Reader doesn’t take me very far usually. So, when I need to look up I have to either have the sites in my Firefox search bar or look up the site url and do a search. Today, tawnypress in Twitter asked for a couple of good WordPress resources and I pointed her to couple of sites I frequent, hackwordpress.com & wordpressgarage.com. I knew I had a dozen more sites in my Google Reader but couldn’t share it with her easily. Select to search just your sites or the web with emphasis on your sites, or the entire web. In the next page, you can try out your search engine results. 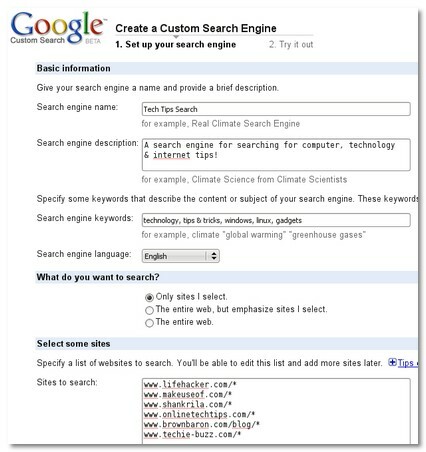 You could create as many search engines as you’d like. You could potentially open this search engine to a group of users you invite or open this upto public to contribute more sites (could end up getting spammed) to your custom search engine. You could also host the search box and the results in your website. Actually an extension of this is available via Google Adsense for publishers. This lesser known gem of a tool is already available with your existing Gmail account. Roll away your own Google powered search engines! I wonder if you could do something similar with the adsense Google search feature- it does allow you to search across multiple sites and use keywords. This is pretty cool but I cannot see the specific benefit, why would these sites not come up with the normal Google search anyway? Are you saying that some results are not relevant enough in Google dues to webmasters manipulating the rankings? Thanks for including HWP in your search engine K! Louise, I think you can. I am about to explore that further as well. olly, that is exactly what I am saying and it’s hardly a hidden secret! 🙂 Plus, the biggest benefit is you are rolling a search engine for sites you ‘know’ that have good and information you need. Kyle.. HWP is an awesome resource for the WP community! 🙂 I usually direct people over there whenever they look for WP advice of course after WP forums. Keep up the great work buddy! I think that’s a great invention, to customize your own google search engine. But I don’t know if I ever use this feature. I’ve been thinking about doing this for awhile now, thanks for a great tutorial. Bookmarked! Custom Google search is a very useful tool. I have found they become more popular if the search you create has a purpose…i.e. I see a lot of do-follow blog custom searches, I see one that is for Keywordluv blogs and .edu blogs, etc as they are serving a purpose and saving users time. I agree that this is a wonderful tutorial. Thank you so much for taking the time to write it. Now I’ll have to get to work on my own search engine. Oh, this is very cool. In fact I really like your example custom search engine. I just did a few quick searches, and came up with better results than I got from google itself for a project I’ve been working on this past week. lol, I should have come to your blog sooner. I also like the idea of setting up my own custom search engines, because to be honest I’ve been pretty annoyed with google lately. It’s kind of ironic actually, since I have a few niche store type websites, but I’ll tell you it’s kind of frustrating, when I type a specific question into google, and then have to scroll sometimes to the 3rd page before I get to a site that isn’t specifically set up to try to sell me something, instead of answering my question (this is especially true if you are trying to find something like directions about your cell phone, or wireless router). Another redundant search engine. I guess if you want to control your users results…. Is easy / possible to then add such a custom search engine to a wordpress blog? Great tutorial and excellent background as to why you might actually want to have your own search engine! I will be featuring it in a future post on my search related blog. I’ve been thinking of adding a google custom search on my site. How quickly is new content indexed? Hi K.. Thanks for this great post. I’ve been planning on making a human resources blogs custom search to search all of the popular blogs. This guide will help a lot in the process.